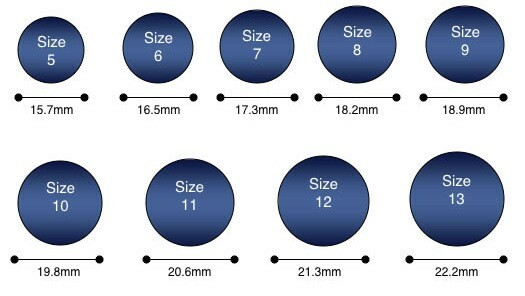 This item also have the 6mm width. Search it from the tungsten ring category of home page. Why choose Tungsten Carbide Jewelry ? Tungsten Carbide is ranked second hardest next to diamond on the Mohs scale, diamond being a 10 followed by Tungsten Carbide as 9. All of our Tungsten jewelry are Cobalt Free and hypoallergenic. They will not cause skin irritations or turn your fingers green. Due to the Hardness of Tungsten, they can be laser engraved, but not hand engraved. All the products you receive with us come with 30 days money back guarantee. Place your ring over the nearest size circle. The inner edge of the ring should align with the outer edge of the circle. If your ring appears to fit between two sizes, buy the larger size. Step1: Wrap a piece of string or a strip of paper around your finger. Step2: Mark the point where the two ends meet. Step3: Measure the string or paper against a ruler to get the circumference of your finger. Step4: Divide that by 3.14 to get the diameter of your finger. Step5: Look up your ring size using the form above.